Observation - Fungus inside dead tree - UK and Ireland. Description: A dead felled sycamore has been cut up, inside was this fungi.It has the same colouring and teiring as H. cirratum. looking at the broken speciman, you can see the newest gills are an orange colour, as they get older(earlier tiers) they lighten in colour. 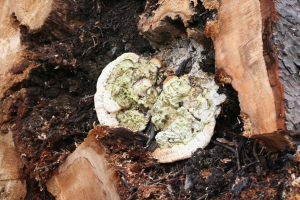 A dead felled sycamore has been cut up, inside was this fungi.It has the same colouring and teiring as H. cirratum. looking at the broken speciman, you can see the newest gills are an orange colour, as they get older(earlier tiers) they lighten in colour.